1Lt Norment Foley, Jr. (P) - All missions flown as First Pilot. First Mission (205) flown with an experienced CoPilot. Mission 206 was flown with a 381st BG(H) formation but landed at Molesworth. 35 mission combat tour completed on 25 October 1944. 1Lt Robert A. "Bob" Rowe (CP) - Flew on all of the 1Lt Foley missions (Except for missions 205, 230 & 259). 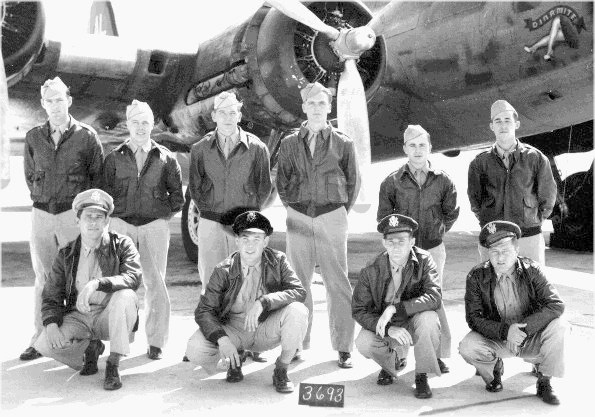 Four missions flown with other Pilots: As CoPilot (205 & 263); As a Lead Crew Tail Gunner/Observer (257 & 264). 35 mission combat tour completed on 30 October 1944. 1Lt James M. "Jim" Conklin, Jr. (N) - Flew on all of the 1Lt Foley missions (except for missions 227, 255, 256, 259 & 262. Three missions flown with other Pilots (213, 215 & 254). 35 mission combat tour completed on 14 October 1944. 1Lt Robert I. "Rocky" Littlefield (B/N) - Flew on 22 missions with the 1Lt Foley Crew: As Bombardier - 205, 207, 211, 212, 214, 216, 224, 230, 232, 234, 235, 236, 237, 238, 240, 244, 245, 246, 247 & 253; as Navigator - 227 & 255. Flew on 13 missions with other Pilots: As Bombardier - 206, 210, 217, 218, 223; As Navigator - 225, 226, 228, 249, 250, 251, 262, 254. 35 mission combat tour completed on 11 October 1944 - mission 255. T/Sgt Edward Snell (E) and T/Sgt Vernelle V. Johnson (R) - Flew on all of the 1Lt Foley missions. 35 mission combat tours completed on 25 Oct 1944. S/Sgt Harrel A. Waltmire, Jr. (BTG) - Flew on 26 credited missions with the 1Lt Foley crew (All missions 223 through 262). Flew on 8 missions with other Pilots (217, 231, 263, 264, 265, 266, 267, 270) 35 mission combat tour completed on 9 November 1944. Sgt Damon A. "Butch" Gordley (WG) - Flew on 14 credited missions with the 1Lt Foley crew - 205, 206, 207, 210(A), 211, 212(AS), 214, 216, 217, 223, 224, 225, 226, 227 & 230 18 August 1944. Flew on no additional 303rd BG(H) combat missions. Sgt Carl W. Seitz (TG) - Flew on 3 missions with the 1Lt Foley crew (205, 206, 207). Was Killed in Action on mission 207 to Hollriegelsreth, Germany , 19 July 1944, in B-17G 43-37930 (No name) (360BS) PU-F. Was hit in the neck by a flak fragment in the target area. Body returned to Molesworth. Waist Gunner S/Sgt Charles R. Stewart became the crew's Tail Gunner on and following mission 214. S/Sgt Charles R. "Chuck" Stewart (BTG)(TG) - Originally the 2nd Crew Waist Gunner but flew no missions as Waist Gunner when the crew size was changed from 10 to 9 men. Flew on all of the 1Lt Foley missions (except for 212): As Ball Turret Gunner - 205, 206, 207, 210(A), 211; As Tail Gunner - all other missions (214 through 262). Flew on one mission as Waist Gunner with another Pilot (269). 35 mission combat tour completed on 6 November 1944. Landing on the European Continent: Mission 259, 18 October 1944 in B-17G 43-38653 (no name) (360 BS) PU-H to Cologne, Germany. Landed at Brussels, Belgium. 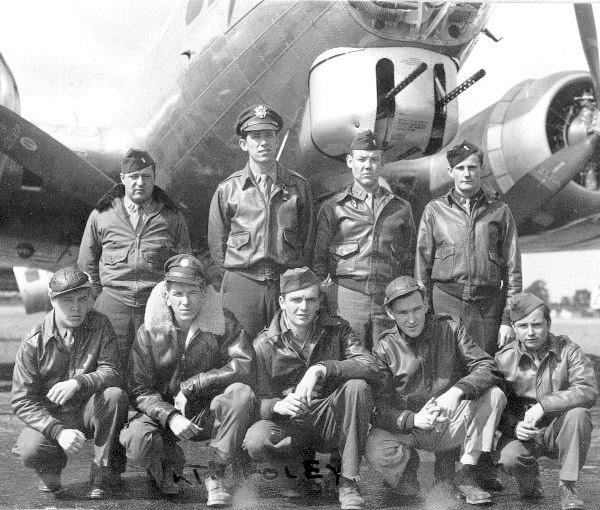 Was one five 303rd BG(H) B-17s that landed on the European Continent when they became low on Gasoline.